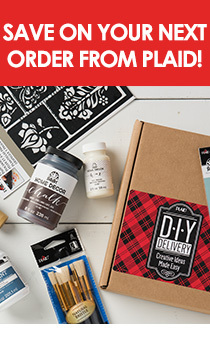 We don't know about you, but one of our favorite reasons to craft is to create unique gifts for our friends and family. Handmade gifts are sure to have a personal touch, plus we create to fit the recipient's own personal style! These are all extra fab because they use Mod Podge Rocks! stencils - check out the six modern designs. They make crafting super speedy, and all you have to do is peel and stick 'em for fast crafting! These ideas are not only fun to craft, but they'll love getting a little something useful to beautify their home! Package this cute mug with some coffee or hot chocolate for a perfect pick me up! What about making one of these for the teachers at school? They are inexpensive and just a touch of greenery adds so much to any space. The stenciled pattern adds a dimensional effect to an otherwise boring basic! Recycle those wine bottles or even the standard glass vases we've all got cluttering up our cupboards - the sparkly touch makes them special again! These are a sweet housewarming token or hostess gift idea. Make this wall art for your sweetie or best friend with a fun phrase. Pick a inspirational or fun word to package as a giftable set! This little mirror adds a punch to any small space or as a part of a wall art grouping. Give the gift of style with this trio of ideas! We love this clip as a way to add some sparkle to a super basic ponytail! Get more 'kicks' with these funky chevron shoe laces - use glitter in their favorite color. Belle of the ball? We think so, when she wears these stunners. Just stick that stencil on, pounce some Mod Podge and sprinkle some glitter to get this cool effect. It's an (adorable) wrap with this sweetly decorated box! Transform that card stock into present-worthy, easily. Make it simply modern with this cute card! What are some of the best gifts you've ever handcrafted? Let us know in the comments!